For a lot of people, summer is the best time of year. It is a time for fun and vacations. It is also a time to catch up on those things that were avoided during the school year such as cleaning out your closet. Summer is a time to relax, slow down the pace, and build some skills. We are going to discuss what you can do with your child over the summer. We understand that summer can become difficult as you try to plan what to do with your kids. Therefore, we want to dig further into how you can do things at home and how educational therapy works during the summer. It is important for us to get across the fact that we strongly believe kids should be able to be kids. We believe they should have a fantastic summer because they earned it. Educational therapy over the summer is about using the skills they learned during the school year, strengthening them, and previewing some of the skills coming up in the following school year in a more fun way. Summer is a much more relaxing time. We often have conversations with our clients in May about whether or not we recommend educational therapy during the summer at all. For a lot of kids, we feel pretty strongly that we either want to reduce them from two sessions to one session a week or we only want to see them for a short period of time and do a more intense approach. We also take into account the fact that most kids have a busy summer schedule packed with traveling out of town, camps, sports, and family weekends. Educational therapy becomes less consistent. 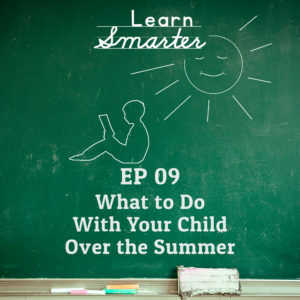 There are a couple of ways that we determine whether or not we make the recommendation to see kids over the summer and how frequently we see kids over the summer. Our first key takeaway is to know your kid. Some kids can take a summer off of “school” while some kids need to use summer as an opportunity to catch up. We recommend that you ask yourself the following questions… What are my child’s strengths? What are my child’s areas of weakness? What did the teacher tell me throughout the year? We hope that you can use report cards and conversations that you have had with your child’s teachers as a guiding force to determine what kind of summer you would like them to have. Another key takeaway is to do things with your child that involve learning without the child realizing they are learning. You can use games, go to museums or zoos, etc. Social learning is a big part of learning. Kids are able to participate in social learning when they go to summer camp as well. There are a lot of ways to help your child build on their academic skills that don’t require you to sit down with them and fill out a worksheet. We think is important for kids to do over the summer and continue to do is reading. Reading is important no matter the age of your student. We know that reading isn’t always a preferred task for kids. There are several ways you can work around this. Call it story time: Do not call it reading. Cultivating a love for stories and words is so critical as children grow up. Read a book as a family: This is a great opportunity to ask questions, make predictions, check for comprehension, and work on things such as main idea, summary, and vocab. For us, it counts if the student is listening to an audiobook or a podcast. As long as they are interacting and engaging with words and stories, and following an idea throughout a period of time, that is enough. If you are working with the student directly and decoding (breaking down the words) is a challenge for them then it might help to use an audiobook and have the student follow along in the book at the same time so that they can see the pictures as well. This will help strengthen the decoding and the comprehension which are the two main parts of reading. Read multiple books at once: Some parents get concerned if their child is reading a book separate from a book they are reading as a family at the same time. This is nothing to be concerned about. In fact, it can be quite beneficial for the child. How many times in life do you just focus on one thing? The answer, most likely, is never. You often have to remember different things about different situations. So have your child continue to read that chapter book on their own and do a book together as a family. Reading a book as a family can be great bonding time. Everyone can take turns reading a chapter (if your child feels prepared enough). Prep your chapter: Let your child know that it is going to be their turn to read a section of the book that you are reading as a family so that you can go over it with them ahead of time. This gives the child a chance to preview it before they have to “perform” it in front of their family. An example of a great bonding experience would be reading Harry Potter together as a family. Depending on the age of your child you can have them read a few sentences here and there and when finished you can follow it up with the movie. Read a menu: A lot of families go out to eat at restaurants. If you know you are going to a certain restaurant, even if your family has been there several times before, ask your kid to help you out in finding something new to eat. You can have them go online to the restaurant’s website and check out the menu. Ask them to go through it themselves and give you some new suggestions on what to eat. There are usually pictures on the menu that you can use to steer them in a certain direction. For example, say you are planning on going to California Pizza Kitchen for dinner, you can tell your child, “I would really love a new salad idea and a new pizza idea.” This gives your child specific tasks and allows them to feel important as they decide. Obviously, your child has to be of a certain age for them to think this type of activity is fun. You can also extend the reading experiences to the grocery store. However you want to approach reading with your family, just make sure you are engaging with words. The next area that you can work on with your child over the summer is on writing. This is another area that can be difficult for a lot of students because they are looking at a blank page. Whenever you are looking at a blank page that you are responsible to fill with your own thoughts and ideas it can be somewhat overwhelming. However, it does not always have to feel like an academic exercise. Start a blog over the summer: Blogging (online or on paper) is a great writing exercise. Your child can recap what they did each day during summer by jotting down quick notes or bullet points rather than writing out complete sentences. A bonus with this form of writing is that it can hold great sentimental value later on down the road. At the end of summer, you and your child can sit down and look back on all of the fun and interesting things you did. The reason why we are specifically calling this writing exercise a blog rather than a diary is because kids these days do not really know what a diary is–they all know what a blog is. Your version of a diary and your child’s version of a blog is essentially the same thing. We suggest calling it a blog so that the buy-in for your child will be much higher. Write a newspaper article: If you take your kid to a sporting event or another exciting event that they are interested in you can have them write an article about it as if they were writing it in the newspaper. This can be another way to engage your child in writing in a way that is enjoyable for them. They can read their article to another family member that didn’t get to go to the event or you can have your child stand in front of you and read their article while you record them on your phone. Articles give your child a framework. In a newspaper article, the W’s (who, what, when, where, why) are usually upfront in the first few sentences. This is great rehearsal for your child to be able to grasp all of these key points and address them. Write a play: Make up a play or they can write a play based off of a book they have read. If your child has siblings they can create parts in their play for them so that way everyone in the family can get involved. Let them talk: When it comes to writing, we understand that not every student wants to sit down and physically write or type something out. That is why we feel that it is absolutely acceptable for a child to generate ideas and have someone else type it. They do not necessarily have to be the ones putting the input into a word processor or on a piece of paper. It is about them generating ideas, putting them in order, and having them make sense. You can also use ‘voice to text’ in Chrome, Google documents, and Word documents. Story Wars: Story Wars is a great website that allows your child to add on to someone else’s story. This is a collaborative writing exercise and kids LOVE this because they get to see what someone else added to their own ideas. Make a podcast: You can also have your child do a podcast and record it on your phone. Generating ideas and generating content is what we are all about. The next area that would be great for you to work on with your student is math. There is a lot of math aversion out there. We came up with some ideas that we feel would be fun and beneficial for you and your family to do. Casino night: You can teach kids how to play Blackjack using candy rather than money. Blackjack is a game that will allow your child to learn fast math. Teaching your child to gamble might seem alarming for some of you but you do not have to refer to it as a gambling game. You don’t have to call it Blackjack at all. Inherently, it is just a card game and you can approach it however you like. Imaginary Budget: You tell your child that they have “one hundred dollars” to spend at a certain store that they love. You have them go online, figure out what they would want to buy, and make sure they have some money left over. On top of math, this teaches your child about money awareness. You can also add a reward in by actually buying them the lowest cost item they chose if they were able to stay under budget. If your child is older you can also have them include taxes as they are shopping under their budget. Fitbit Goals: Have your child set a steps goal and have them figure out how many steps they need each day in order to achieve their goal. Build time awareness: You can have an activity that you are going to do as a family and have your child make a prediction for how long it is going to take. Or ask them how long you need to get ready for something. You can then compare the predicted times to the time it actually took to get ready or to complete the activity. Does your child tend to be right? Tend to be wrong? Build that awareness because it will increase your child’s accuracy over the long run which is crucial when you are heading into the school year. It will help with time management. If you do not know what executive functioning is, be sure to refer back to blog 05 where we discuss this topic. We are strong advocates for building executive functioning skills. We have several ideas for you to help your child do just that. Cooking: Cooking is a great executive functioning exercise because there are seven or eight steps in cooking. Figure out what you already have versus what you need to buy, and making a list. Making a plan to go to the store. Actually going to store and finding everything you need. (Keep in mind that your child should be an active participant in all of these steps.) You can also put in practicing using a budget in this step. Coming home and get everything ready to cook, assuming you are doing it right away. We recommend doing all of these steps together in one big chunk of time. Cook! We could break this step down even further because you are actually following the step by step instructions. The last step of cooking is getting the table ready and preparing for the food to be served. This is an important step for it teaches kids important life skills as well as executive functioning skills. This is also a great way to get kids to try something new. If they are involved in the whole process of selecting the meal they will be more excited to try their finished product. A lot of kids, especially the little ones, love legos. If you don’t already have a lego set and you want to go to the store and buy one you could potentially do this as a reward or use this as another budget activity. The great thing about building a lego is reading the instructions. Let your child decipher the instructions and then explain them to the group or to you. You all are then following the instructions to create the lego. You have to make sure you have all of the pieces. Maybe you decide to put them aside into categories. If the toy already comes with the pieces separated you can combine them all and mess them together without your child seeing so that they can separate them themselves. You can also go through each step and figure out what specific pieces you will need for each step as well as where they go. This is great practice for your child to learn how to determine exactly what they need in order to complete a specific task. Another idea for this activity is to have your child draw their own image of what they want to build with their legos and create an instruction booklet. Then you as the parent can put it together as you follow along with the instructions your child created. Family Fun Plan: Partner with your child to plan a family vacation, a family fun day, or a family fun list. A family fun list involves deciding, as a family, all of the fun things you want to do over the summer. Let it be aspirational. Nothing is off the table. You might be surprised by some of the really sweet things that kids want to do with their parents over their summer vacation. After making the list, work with your child and have them help you plan out all of these activities on a family calendar. You do not have to feel pressured to complete every single activity on the list. As you plan it out, see how many you are able to do. You can always make note of the activities you did not get to and save them for a later time. In terms of planning a vacation, we understand that this is not doable for all families. Even if it is just a day vacation, or driving somewhere, that counts too. You still have to plan out the trip, figure out a budget, directions, time, etc. Create a board game: The last activity you can do to help build executive functioning skills is creating a board game. There are so many components you can put into creating a game that makes this a beneficial and fun task. There is also a sense of ownership that kids tend to love when they create and play their own game. You can start creating a game by using a poster board to write out the rules of the game and what the game is going to look like. Planning it all out ahead of time will lead to a successful end product. There will be problem-solving opportunities as you come across rules that don’t quite work. When the game is complete, you can have your child teach others how to play. We hope you have enjoyed all of these ideas we have shared and that you can use some of them throughout your summer with your family. Educational therapists and tutors are always available over the summer if you do have any questions or concerns. Or if you have more specific goals you would like to be met. Be sure to follow us on Instagram, @LearnSmarterPodcast or join our Facebook group Smarties of the Learn Smarter Podcast. If you are interested in working with us one on one you can go to our website, LearnSmarterPodcast.com and go to the “work with us” area. We would love to be able to connect with you there.